What does this true Love Quote tell us? This beautiful Love Quote enriches your thoughts with the small, subtle yet beautiful message of being in whole and complete service of those we love. In the process of surrendering one’s self in being the giver, we become responsible for those little ways that bring happiness for our special one. Love quotes instill in us the belief that love sees no boundaries. It is the sheer power and the inner force that Love brings along with it, that aids us in giving and keeping no desires of getting something for it in return. Being selfless is one form of that we as humans acquire, when experiencing the beautiful feeling of love. In the experience of Love, there is no looking back to count, and keep a tab on what, when where and how much has been spent on the person that we love. For the person we love, to make them happy, wind, sunshine, storms or snow, come what may, you see nothing. No hardships can be seen as obstacles when it comes to giving in Love. Myths and legends overflow with examples of giving away even your life, when it comes to testing of real Love. Love is one such feeling where you lose yourself to attain a higher level of oneness with the one you love. When Love strikes, there is nothing that can stop you from giving away all that you have, whether time, the deepest of your emotions or even sacrificing your life. 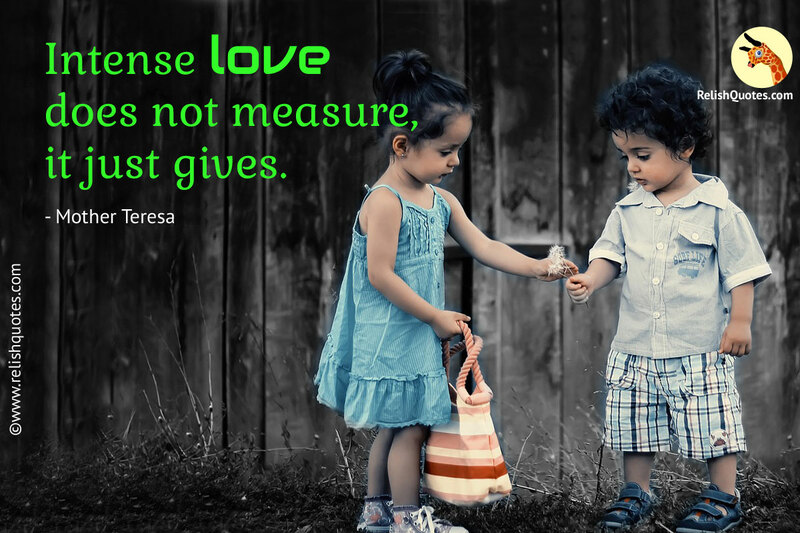 In intense love there are no parameters to measure. Pure love has no boundaries or limitations, of giving your heart and soul and even your complete self. Intense Love will always give and never keep any kind of expectations of returns. To become selfless is a natural change to occur in our normal behavior. Loving selflessly and giving away the complete you, to the person you love, takes the intensity of Love even higher.